Learn about blocking and reversing UFC 2 transitions in this web tutorial. Below we will go over four important things to know about the game. 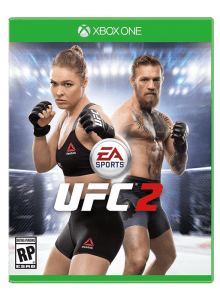 I hope this helps you master EA Sports UFC 2. The fighter will always give some form of visual clue as to where they are transitioning to. Knowing what to look for and where to look is key in understanding how to stop or even reverse a transition. I will provide many examples of these clues throughout the video, but you will be looking for hand placements such as this to figure out how to defend your position like RT/R2 and right on the right analog stick in this case. Ground Transitions are a little easier to read as the fighter’s entire body moves in the direction you need to block. As you can see here the fighter’s arms and body is moving to the left, so you would block this with RT/R2 and Left on the right analog stick. You would do the same block of RT/R2 and left for this transition as well. You can also look at the arm movements, and particularly the inside arm in side control. If they are transitioning to the left like here, you would block again with RT/R2 and left on the right analog stick. Next, you will see the movement for a transition to the right from side control bottom which is block by using RT/R2 and right on the right analog stick. Here you will see a clue of what to look for from the top sprawl position. You will see their hands move either left, right, or up. This instance the fighter is moving to the left, so you would block this with RT/R2 and left on the right analog stick. I don’t get the full block here, but we keep the fight on the ground. UFC 2 transitions and throws can happen at the same time; who will win is determined by attributes and stamina. Here you will see what happens when both fighters are transitioning at the same time. If the fighter on the bottom wanted to have blocked this transition, they would have use RT/R2 and right on the right analog stick as per the yellow cue. For the attacker, as I am completing this transition, I am holding down RT/R2 and left on the right analog stick as per the cue in green. This will cause an instant block or even a reversal in some situations so look out for it on offense and defense. The clue here is the hands on my hips and the attempt to push me off with knees. This is defended by pressing RT/R2 and up on the right analog stick. You will see it a couple more times afterwards. When trying to defend your position, consider the options the other fighter has. Not including get-ups, most of the transitions can be defended with either left or right on the right analog stick and RT/R2. For example, out of half-guard bottom, I know the other fighter will usually go for full guard (right here) which is defended with RT/R2 and right on the right analog or backside(left). Getting to know all of the animations for transitions, escapes, and other moves, will aid you greatly in knowing what direction to hit in addition to RT/R2. How quick your ufc 2 transitions are and your likelihood of getting reversals is based on your ground game rating, stamina, and fighter style. A block and a reversal are done the exact same way; however timing is the determining factor for reversals. You either have to guess correctly, or hit the block nearly at the same time as the person attempts to transition.